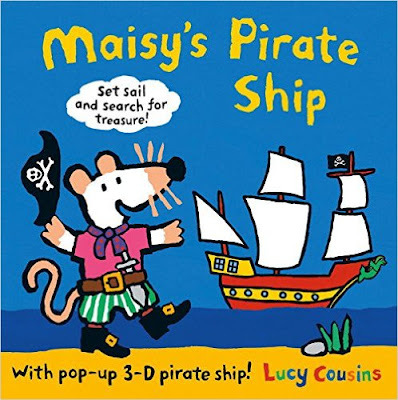 NEW from Lucy Cousins: Maisy Goes on a Plane and Maisy's Pirate Ship : A Pop-up-and-Play Book!!! We are long time Maisy Mouse fans around here. It all began with Bookworm1 (now age 9) and has continued down to Bookworm4 (age 3). Each child has enjoyed some time with Maisy Mouse and we all reach for Maisy books we've never seen before. When I noticed that there were some new titles coming out, I couldn't resist reviewing them. 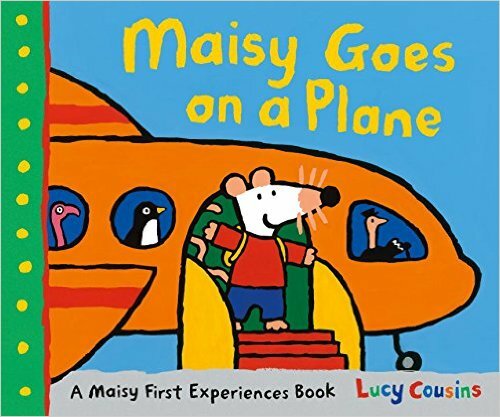 Maisy Goes on a Plane is a "Maisy First Experience Book". If you are preparing to travel (or if you have a regular habit of it) your kids will get a kick out of this one. Maisy is off to the airport to leave for a trip to visit her friend Ella. She checks in and goes through security just like all the rest of us. When she boards the plane she makes her way to her seat and is delighted to find herself sitting next to a window (every child's delight). Seatbelts buckled, the plane "whooshes" off into the sky. The flight attendants serve drinks and then the predictable happens, a long line forms by the restroom. All's well though and the flight goes smoothly. Upon landing the plane "gives a little bump and a jump" and everyone is safe and happy! Bags collected, it's time for Maisy to enjoy some time with her friend. As usual, Lucy Cousins introduces life experiences in a cute, fun way. Nice done! Maisy's Pirate Ship is exciting in that on the very last page there is a large pop-up pirate ship and stand up paper dolls. This is definitely a novelty book but with a (very) short story attached. Maisy and her friends are off "having a pirate adventure on the ocean", practicing some sword fighting and looking for buried treasure. Their treasure claimed, it's your turn "to be a pirate." Unfold the ship, punch out the dolls, and beware of sea monsters! Again, it's just cute and definitely appeals to little kids. Many thanks to Candlewick Press for sending copies of the above titles my direction in order to facilitate this review. I received no additional compensation and all opinions are my very own. 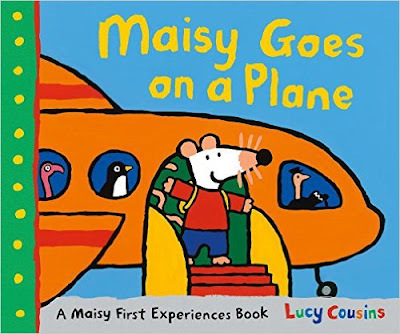 If you've got a Maisy fan in your home or you are looking for travel-themed books, check out the first title for sure! I think you'll like it. Would you like to win a copy of the above two titles? Simply leave a comment below (making sure to include a valid e-mail address!) in the comment section. The winner will be randomly selected (using Random.org) by counting comments. This contest is open to U.S. Residents only and will be open through Tuesday, October 20th. Best to you! This contest is now closed. The winner, as selected by Random.org, is #5 - Anita. Congratulations! How fun! My daughters would love these books. Thank you for the wonderful giveaway. Ooh, I bet my son would love these. Such cute books. I know that my daughter would love them. Thanks for having the giveaway.